It seems it may be difficult to not notice it, given that Edmonds finally names, on the record, for the first time, in a right-leaning periodical founded by Pat Buchanan, the identity of the currently-serving Democratic Congresswoman she has previously described as married with grown children and having been “hooked” into participating in a lesbian affair with a Turkish foreign agent, as she was secretly video-taped for blackmail purposes. Edmonds has alluded to the Congresswoman, without naming her, in the past, most notably in her recent sworn and video-taped deposition in the Schmidt v. Krikorian case now pending before the Ohio Election Commission. In that testimony, she did manage to name the names of other Congress members she had previously identified publicly. At the time, we (and virtually no other media outlets) reported on her disclosures that Dennis Hastert (R-IL), Bob Livingston (R-LA), Dan Burton (R-IN), Roy Blunt (R-MO), Stephen Solarz (D-NY) and Tom Lantos (D-CA, deceased), were all participants in blackmail and/or bribery schemes by and with agents of the Turkish government, as she became aware while translating wiretaps in the FBI’s counterintelligence division after 9/11. Some of those crimes are said to have resulted in the theft and sale of nuclear weapons technology to allies and enemies alike. In her 8/8/09 D.C. deposition, she discussed, for the first time on the public record since being previously gagged by the Bush Administration’s use of so-called “State Secrets Privilege” (twice), details of what she heard while reviewing and translating wiretaps of Turkish agents who were targets of a long-running FBI investigation centered out of Chicago, but extending far beyond. She went on to add that she hadn’t used her name in the past because she left the FBI before knowing whether or not the information was actually used against the Congresswoman to blackmail her, or if the woman had even been made aware of it. “I don’t know if she did anything illegal afterwards,” Edmonds said. The Congresswoman in question, according to Edmonds, is Illinois’ 9th-district Rep. Jan Schakowsky. The BRAD BLOG has attempted to contact Schakowsky’s office over the weekend, but they have yet to return several calls and emails seeking comment. We will, of course, update this story if we are able to receive comment. The reason for attempting to get at Schakowsky, Edmonds believes, is so that they would be able to get both her “and her husband Robert Creamer to perform certain illegal operational facilitations for them in Illinois,” along with Hastert, who was already on the payroll, and several other Chicago officials. Edmonds has previously disclosed some of Hastert’s dealings with shady Turkish operatives. Many of those charges were originally detailed in a 2005 Vanity Fair exposé by David Rose, which focused on the allegations of payoffs to Hastert by the Turks to the tune of some half a million dollars, or more. 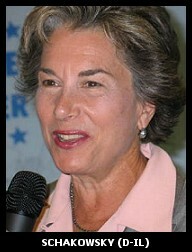 Schakowsky’s husband, lobbyist Robert Creamer, was indicted on 16 counts of bank fraud in 2004. In 2005 he pleaded guilty to one count and was sentenced to five months in prison and 11 months of house arrest. He was released from the federal penitentiary in 2006. Since leaving Congress, Hastert, as Edmonds points out to American Conservative, and as previously reported, now works as a registered lobbyist for the Turkish government for some $35,000 a month. Some more details from the interview in a moment, but I want to note that Giraldi’s interview is exceptional and brings together a great deal of the entire breadth of Edmonds’ long-quashed allegations in a simple, clear, cogent, easy-to-understand (even for beginners to the story) narrative. He’s done an excellent job in that regard, and Edmonds told me over the weekend that she believes it was due to his own knowledge of the topic, from both his years of covering her story at various times, as well as his own inside knowledge as a counterintelligence officer at the CIA, working a similar beat. Edmonds is more specific than even in her recent deposition, in explaining what she’s been disallowed from talking about publicly for so long. She names very specific names, describes massive government infiltration and the theft of weapons technology and nuclear secrets beginning at the very top of government (the State Department and top White House officials and appointees) going through Congress (at least half a dozen current and former members) and defense contractors (RAND), through Ph.D. programs (MIT) and highly-classified nuclear facilities (Sandia, Los Alamos) and even, for good measure, through the media (New York Times) and beyond. Bingo. And shy of investigation from other media and/or law enforcement, that could still remain the case, even after AmCon’s exclusive. Virtually all of the mainstream corporate media outlets who have bothered to investigate her story over the years — largely before Edmonds was able to speak out herself — such as CBS’ 60 Minutes, Vanity Fair, Sunday Times of London (front-page series here, here and here), etc. — have almost all been able to find corroboration from various sources, including within the FBI, for the allegations. At right is a brief 2007 video compilation by Edmonds expert Luke Ryland, featuring everyone from Grassley to Sen. Frank Lautenberg (D-NJ) to “Pentagon Papers” whistleblower Daniel Ellsberg to even Paul Newman singing her praises. The most serious allegations in the piece are detailed against Marc Grossman who had served as the Ambassador to Turkey before being named as the third-highest official at the State Department by the Bush Administration, where he is said to have “received money directly” for his work on behalf of Turkish agents. The article explains, in the most detail to date, Grossman’s criminal involvement as the ring-leader for much of this, as first exposed in a January 2008 London Sunday Times front page story which described Grossman’s activities but, due to British libel laws, didn’t identify him by name. The paper also followed it up with some corroboration of FBI case files on the allegations later that month, and then dropped a blockbuster concerning Grossman’s outing of Valerie Plame-Wilson’s CIA front company Brewster-Jennings to Turkish diplomats long before she was ever outed publicly by Karl Rove, Scooter Libby and Robert Novak. A great deal of explanation is given concerning Israel and the American Israel Public Affairs Committee (AIPAC)’s extremely close alliance with Turkey and the American Turkish Council (ATC) in all of these matters, and how the now-deceased Democratic U.S. Congressman from California, Rep. Tom Lantos was “the top person obtaining classified information” concerning Israel in Congress for both groups. Details about how the Bush Administration, including officials such as Douglas Feith, Richard Perle and Paul Wolfowitz, were “discussing with the Turkish ambassador in Washington an arrangement whereby the U.S. would invade Iraq and divide the country” between the U.S., Great Britain, and possibly Turkey, some four months before 9/11 occurred. Former Bush Sr. administration official Brent Scowcroft, who had become chair of the American Turkish Council (ATC), is said to have been involved in similar discussions as well prior to 9/11, along with James Baker and Richard Armitage. Scowcroft, Edmonds alleges, only came out against the Iraq War when the George W. Bush administration decided against an arrangement for a “Turkish protectorate” in northern Iraq. “The epicenter of a lot of the foreign espionage activity was Chicago.” Hence the involvement of Hastert and Schakowsky, all of which leaves Edmonds with many concerns about Illinois’ former U.S. Senator Barack Obama and his current Chief of Staff, the former U.S. Congressman from Chicago, Rahm Emmanuel. “Every time they wanted something on Azerbaijan, Turkey, and Turkmenistan, for example, they just faxed it over [to the Times], and it was run under their own guys’ name, even though it was written by the State Department,” she said during our conversation on Sunday. “This was an ongoing operation, at least during a four year period of time” from 1997 to 2001. Edmonds was fired by the FBI in 2002, after she began reporting to her superiors on a colleague in the translation department who was, herself, a member of one of the Turkish organizations being targeted by the FBI’s counterintelligence investigation. Giraldi’s article in The American Conservative should be on newsstands and on the Internet, in full, at their website by Tuesday. * * *Sibel Edmond’s complete 8/8/09 video-taped deposition in the Ohio Election Commission’s Schmidt v. Krikorian case, where she was allowed to speak publicly, on record, for the first time since being gagged by the Bush Administration, can be viewed here. The text transcript may be downloaded here [PDF]. Shorter excerpts from the deposition transcript related to corrupt by specific members of Congress can be read here. She is likely to be called to testify in the case as a witness, live on the stand, when the hearing resumes on October 1. 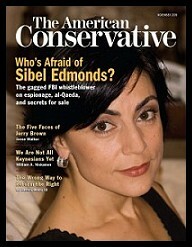 * * *Please consider donating to The BRAD BLOG in support of our years-long continuing coverage of the Sibel Edmonds case.